Original Editors - Jordan Dellamano & Daniel McCoy from Bellarmine University's Pathophysiology of Complex Patient Problems project. Athletes also have an increased risk for dehydration due to environment and physical exertion. This CDC web page has information about heat illness including dehydration among high school athletes. A study done from 2009-2012 with participants ranging from ages 6-19 years old found that inadequate hydration occurred in 54.5% of participants. Of those participants, it was found that males were at increased risk for dehydration. 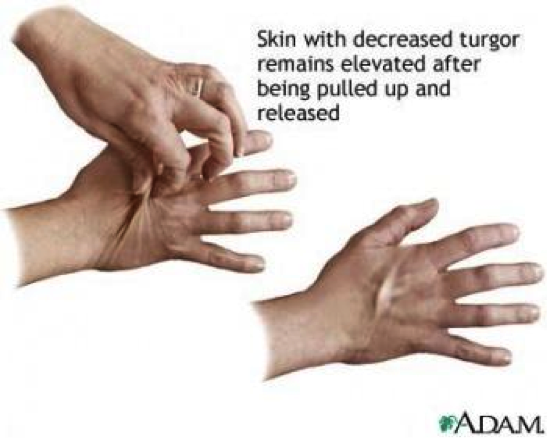 With 10% to 15% fluid loss, may experience symptoms of muscle cramping, dry and wrinkly skin, beginning of delirium, painful and/or decreased urine output, and decline in eye sight. Losses of water greater than 15% are usually fatal. - Increased fluid loss, for example, diarrhea, vomiting, fever, polyuria, wounds. - Polypharmacy: more than four medications. can be taken orally or as a suppository. A Primary Care Physician can often diagnose dehydration based off of a person's physical signs and symptoms such as skin turgor, color of urine, low blood pressure, rapid heart rate, and sunken eyes. To help confirm a diagnosis of dehydration and to what degree, a blood test and urinalysis may be performed. Blood test: can check levels of electrolytes like sodium and potassium, and how well one's kidneys are working. 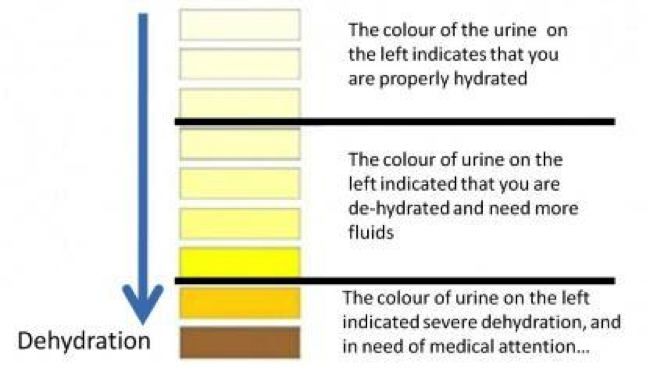 Urinalysis: can show whether a person is dehydrated and to what degree, using 3 evaluation methods: visual exam, dipstick test, and microscopic exam. The dipstick test looks at acidity or pH, concentration, protein, sugar, ketones, bilirubin, evidence of infection, and blood. The microscopic exam looks at white blood cells, red blood cells, epithelial cells, bacteria or yeasts, casts, or crystals. Dehydration can cause serious systemic involvement, especially severe dehydration. Some problems that may occur include: heat injury, cerebral edema, seizures, hypovolemic shock, kidney failure, coma and death. Heat injury: Heat injury occurs most often in individuals who exercise vigorously and sweat excessively. Severity of heat injury ranges from mild heat cramps and heat exhaustion to a more life-threatening heat stroke. Cerebral edema: This condition, also called swelling of the brain, occurs when one is trying to rehydrate. Cerebral edema occurs when one's body tries to pull too much water back into its cells causing them to swell and rupture. Seizures: Seizures occur when one's electrolytes, specifically sodium and potassium, are out of balance and send mixed signals between cells.This can lead to involuntary muscle contractions and loss of consciousness. Hypovolemic shock: This occurs when a low blood volume causes the person's blood pressure and amount of oxygen in the body to drop. This is one of the more serious conditions that can come from dehydration. If not treated, it can become life threatening. Urinary and Kidney Dysfunction: Prolonged or repeated bouts of dehydration may induce Urinary Tract Infections, kidney stones and eventually kidney failure. Kidney failure is potentially a life-threatening problem that occurs when a person's kidneys are no longer able to remove excess fluids and waste from the body. Coma and death: If severe dehydration isn't treated quickly, it can be fatal. The treatment of dehydration is best corrected with replenishment of necessary water and electrolytes. For minor dehydration, consumption of a sports drink, like Gatorade or Powerade, will be sufficient in rehydrating the body. Note: Solely drinking a sports drink for rehydration for more moderate to severe cases can cause or worsen diarrhea due to the high level of sugar. Oral rehydration solution (Pedialyte or Hydralyte): used to treat children and infants who have diarrhoea, vomiting, and fever. These solutions are able to replenish fluid and electrolytes with a specific ratio of water and salts. Start with a teaspoon (5mL) every 1-5 minutes and increase as tolerated. Avoid certain foods and drinks: milk, sodas, caffeinated beverages, fruit juices, or gelatins can make symptoms worse. Water: best for those with mild to moderate dehydration caused by diarrhoea, vomiting, and fever. Other liquids like full strength fruit juices, and soda can make diarrhea worse. Avoid salt tablets: they can cause hypernatremic dehydration in which the body is not only short of water but is also in excess of sodium. There is no direct physical therapy intervention for dehydration in the severe category; however, prevention and fluid replacement orally is something physical therapists can influence through patient education. Patients should also be educated about the signs and symptoms of dehydration in order to know when they may need to seek help. This is done by proper knowledge of hydration. -It is recommended by the American Heart Association to drink water before being outdoors in the heat. This way you do not have to play catch up with Hydration when strain has already been placed on the heart. 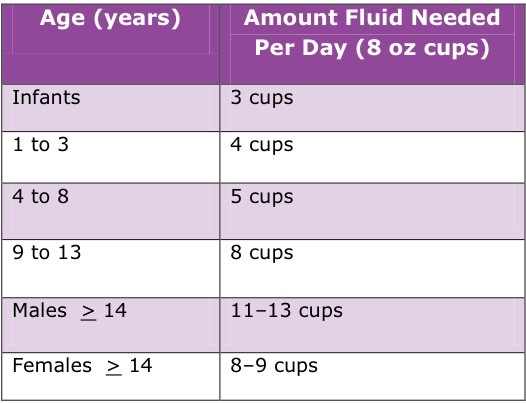 -Fluid intake also needs to be increased in cooler environments. ↑ 2.0 2.1 2.2 Bunn D, Hooper L, Jimoh FO, Fairweather-Trait SJ. Water-Loss dehydration and aging. Mediterranean Diet and Inflammation in the Elderly. 2013; 10.1016/j.mad.2013.11.009 http://www.sciencedirect.com/science/article/pii/S0047637413001280 (assessed 3 April 2017). ↑ 3.0 3.1 3.2 3.3 3.4 MayoClinic. Dehydration. Mayoclinic website. 2014. Available at: http://www.mayoclinic.com/health/dehydration/DS00561. Accessed March 30, 2017. 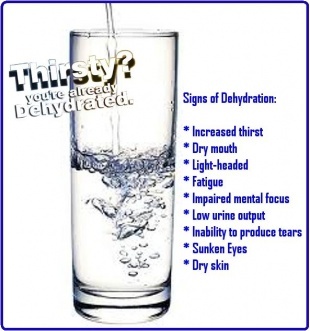 ↑ Dehydration-What is Dehydration?. News-medical website. Available at: http://www.news-medical.net/health/Dehydration-What-is-Dehydration.aspx. Accessed on March 30, 2017. ↑ Kenney EL, Long MW, Cradock AL, Gortmaker SL. Prevalence of Inadequate Hydration Among US Children and Disparities by Gender and Race/Ethnicity: National Health and Nutrition Examination Survey, 2009–2012. American Journal of Public Health. 2015;105(8):e113-e118. doi:10.2105/AJPH.2015.302572. ↑ 9.0 9.1 9.2 9.3 9.4 Goodman, C., & Snyder, T. (2013). Differential diagnosis for physical therapists: Screening for referral. (5th edition ed., pp. 171). St. Louis, MO: Saunders. ↑ 10.0 10.1 Dehydration-Home Treatment. WebMD Website. Available at http://www.webmd.com/fitness-exercise/tc/dehydration-home-treatment#1 (2015)Accesed March 30,2017. ↑ Dehydration. WebMD Web site. 2013. Available at: http://www.webmd.com/a-to-z-guides/dehydration-adults?page=3. Accessed March 15, 2013. ↑ Urinalysis. Mayo Clinic Web site. 2011. Available at: http://www.mayoclinic.com/health/urinalysis/MY00488/DSECTION=results. Accessed March 21, 2013. ↑ Vorvick L. Dehydration. U.S. National Library of Medicine NIH Web site. 2015. Available at: http://www.nlm.nih.gov/medlineplus/ency/article/000982.htm. Accessed March 30, 2017. ↑ Quaglio L. The Dehydration Equation. American Fitness. Winter2017. Available from: SPORTDiscuss with Full Text. Accessed on March 30,2017. ↑ Pariser G. Nutrition for Exercise Performance. Powerpoint Presentation Given at Bellarmine University Spring 2016.